Tie Dye at the Pig Roast! So who wants to do some Tie Dye? As you may be aware, we are trying to raise money for our new playground. I had the idea of offering a Tie Dye Party at our Annual Pig Roast as one way to raise some money. I did this for my sons’ birthday party last year and it was a HUGE hit! We are not talking your off the shelf Tulip brand dye that looks muddy and faded and doesn’t hold up to washing. This is the stuff the professionals use. Bright, vibrant, and colorfast! 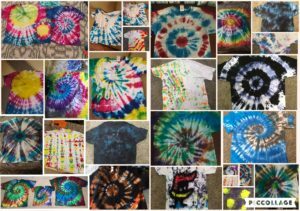 I will have full color tutorials available for all of the different Tie Dye techniques you see and can assist as needed. We will have 7 colors to choose from. 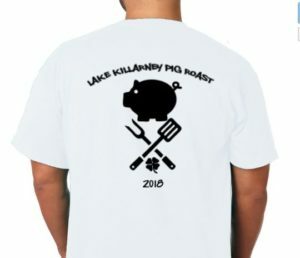 T-shirts will have a custom printed design representing Lake Killarney’s 2018 Pig Roast. The cost will be $15 per shirt. I figure we need to sell at least 50 to make this a worthwhile event. You will use the Google Docs form below to submit your order and I will email you an invoice for your total due. You will need to mail/drop off a check or cash no later than June 29th at my house. You guys! This is so much fun! What better way to raise money for a big project, have fun with your neighbors, and take home a souvenir from the Lake Killarney 2018 Pig Roast! I’m including examples of shirts from my last party as well as a mockup of the design for the shirt. Next Article Next post: Reminder to Sign Up for Tie Dye!